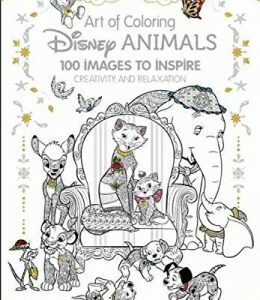 Stumbled across this: It’s a new Disney coloring book, decidedly “with a difference”, called Art of Coloring: Disney Animals. It’s part of the Art of Coloring series, designed to “inspire creativity and relaxation”, where familiar images are split up into many small segments designed to be filled up quickly with small dabs of color. In this case, images of Disney animal characters from several decades. “Relax, and let the creativity flow through you. Whether a skilled artist or an everyday dabbler of drawings and doodles, fans of all ages will enjoy these stunning pen-and-ink illustrations of beautiful landscapes, elaborate patterns, and memorable characters from Disney’s hit animated feature films themed to cute and cuddly animals.” It’s published in hardcover by the Disney Book Group, and it’s available now over at Barnes & Noble.